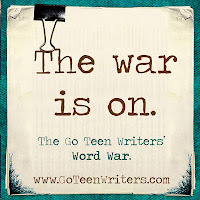 A week ago, I woke up Monday morning to find this post on one of my favorite teen writer blogs. It announced the opening of five day word war between who wanted to participate. Being the crazy, masochistic that I am, I immediately started writing. My original goal was to write 10,000 words in the five days. But after day two, when I'd already cranked out 5,000 with an average of 2,500 a day, I shot for higher. 12,500. I thought I could make it. Wednesday I was still going strong with 7,500 K under my belt. But then Thursday struck. Last Thursday, I got up, went out an bought some summer clothes I seriously needed, (Not really. But they're really cute.) then I came home for a few hours, which I spent working on all things VBS, before heading back into town for a VBS meeting. I got home at 10:00, very tiered from a long meeting and generally busy day. And I decided to go to bed. With zero, 0, words. Which left me at 7,500 with ONE day left. And so while I didn't make my final goal of 12,500, I was only 500 words shy. Which means I wrote 12 K in 5 days! That's totally unheard of for me. That's mow much I right in one fourth of November. I also wrote I've ever written in a single day at 4,338 words. This inspired me to go back through my writing and crunch some numbers. From very early on in my writing I've kept a spread sheet that tallies how many words I write each day that I actually write. I was six thousand words into my fist novel when I started keeping track. My first novel took my roughly ninety days of writing to write, but those ninety days were spread out over three years. The most I wrote during that novel was an even 3000 words the day before I finished it. That novel was finished on a Tuesday. On average, I wrote about 511 words each time I sat down to write. The first draft was complete at 46,000 words. My second novel was written mostly during NaNoWriMo and Camp NaNoWriMo. It took me 85 days of actual writing to write, spread out over five and a half months. The most I wrote in one day was 3468, four days before I finished it. I finished it on a Wednesday. I wrote an average of 1153 words per writing day. The first draft was complete at 98,000 words, double my first manuscript. That catches us up manuscript number three. I'm writing this post on Saturday and as of now, me from the past hasn't finished the novel yet. I'm REALLY SERIOUSLY close to the end of this novel. In fact, I hope to finish it today. I've spent about 35 days writing this novel, spread out over two months. My best day was yesterday with 4,338 words. Like I said, I think this is two days before I finish the novel. I've written about 1,090 words per day. The novel will end up being about 40 thousand words, which is about 15K longer than what I thought it would be. All in all, this most has just made me realize how much I've grown as a writer. It took me over three months to reach 12K in my first novel, 7 days to reach it in my second novel, and 5 now. If you had told me three years ago that I would one day be able to write 12K in five days, 4K in one, I would have laughed you out of the room. So, how have you seen yourself grow as a novelist? For me, completing a novel, even a short one, in less then three months is huge. What about you? Comments make me happy. Drop one, if you feel like it. Also, do a five day long word war with a large group of people. You might just surprise yourself. Don't forget that you can now follow me on Twitter @SarahFaulknr. I am in complete awe! I don't think I've ever written that much in five days. LOL Kudos to you!! The winner wrote over 63K! That's insane. I don't think I can even type that fast. 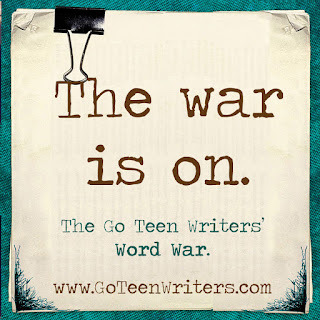 My eldest niece is hooked on writing after participating in last year's NaNoWriMo. She's still at work on that novel, too. (She reached her word count, while I still fell a few thousand short of the 50k goal). We're already planning what we'll write about in November. Yeah! It's really fun for me to write like, 1K and think "That used to be a really great two days work when I was first writing."